(CNN) - Bad weather prevented Mitt Romney from making it to Tallahassee, Florida Thursday, but it didn't prevent him from scoring an important endorsement. State Senator John Thrasher, a former chairman of the Republican Party of Florida, says he's ready to throw his support to Romney if the former Massachusetts governor and 2008 GOP presidential candidate makes another run for the White House, as expected. "If Governor Romney decides to run for President in 2012, I will absolutely be supporting him and helping him in Florida," Thrasher said in an email to the Florida Times-Union. "He would be a great GOP nominee." Last June Romney traveled to Florida to endorse Thrasher in person for his 2010 re-election bid to the state senate. 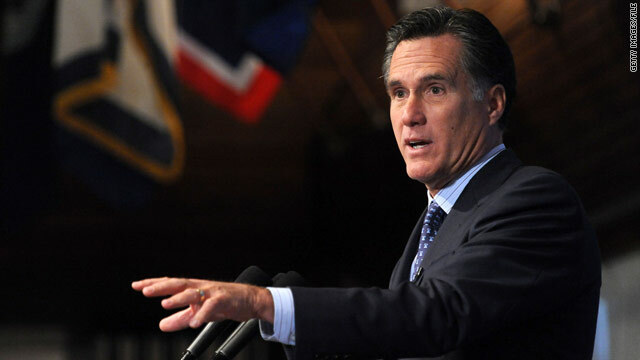 Romney was supposed to be in Tallahassee Thursday, meeting with Republican lawmakers and officials. But the trip into Tallahassee was canceled due to bad weather, according to a source close to Romney. The Sunshine state is likely to play a very influential role in choosing the next Republican presidential nominee. Florida will most likely be one of the early states to vote in the primary and caucus calendar, and the party's presidential nominating convention will be held in Tampa. But there is some controversy. The primary is currently scheduled for January 31, which breaks Republican National Committee rules, which call for the contests in Iowa, New Hampshire, Nevada and South Carolina to be held in February, with all other primaries and caucuses to be held starting in March. No matter what your stand is on the issues, odds are Romney has the same stand or used to. He was pro choice, now pro life. He was for Romneycare, now against the identical Obamacare. Flip flop flip flop. The only thing he has been consistent on is that he is still a corporatist warmonger. I never thought I would find myself agreeing with the likes of Ann Coulter and Rush Limbaugh, but they are RIGHT. Coulter said if the GOP nominates Romney they'll LOSE and Limbuagh said the GOP field for 2012 so far is WEAK. And although I hate to agree with them on anything. I admit I'm loving every minute of it. Maybe Mitt should get ready to run in 2016! only jesus can help you, and he already endorse the president. Nice piece CNN! I think Romney would make an excellent president. He inspires confidence. Romney has extensive private sector experience and it’s the private sector that will sustain an economic recovery. Romney is a moderate conservative and won’t pander to the extreme far right. I don’t want to return to Bush and I don’t want to continue with Obama – it’s time to turn over a new leaf! Romney for president! State Senator John Thrasher who's he never heard of him. Is he mormon also. If Mittens isn't the Republic "Kerry" Candidate . . . I mean, the hair, the haugtiness, the manner born. Romney has already been there and done that. The GOP chose McCain. McCain had absolutely no chance of winning yet all of the media tried to make it look like a REAL race. Getting back to Romney, he won't have the Tea Party's backing and while I really don't care about the Tea Party, they will cause whats left of the GOP to implode. And if you will please take notice, I never stoop down to name calling, I will continue to take the higher ground and just state my own personal opinions. Does that mean that Jack Thrush or James Tracker is as fat as Rush Limprick and also from Florida? "Bad weather prevented Mitt Romney from making it to Tallahassee, Florida Thursday"
Obviously, it was God's will. Who cares that a Republican endorsed another RepubliCAN'T – especially during this time when they are destroying America and the middle class! !